As the perfect piggyback to yesterday’s post, allow me to introduce you to the work of Karen Ruane, who I believe is single-handedly (pun intended) keeping alive many traditions of sewn craft, with a particular focus on embroidery. 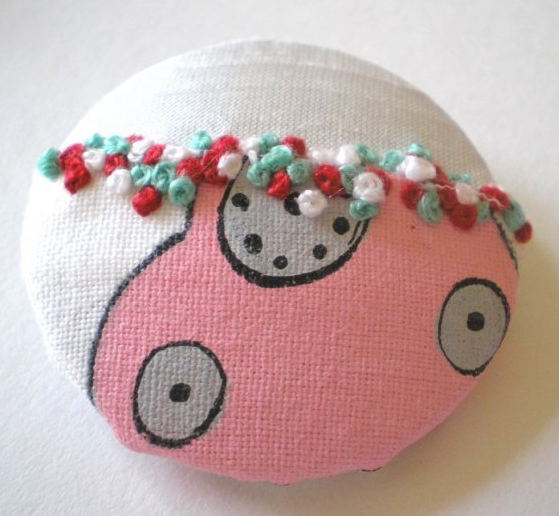 Pictured above, from Karen’s Etsy shop, Contemporary Stitches, is one of a pair of handmade buttons. 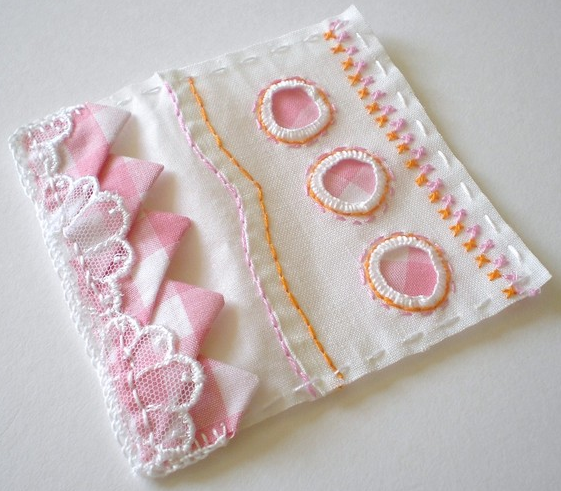 What a gorgeous treat for the closure on a handcrafted garment! I first met Karen over on flickr, during my aforementioned personal adventures in stitchiness. When she put something of mine in her favorites list, I was entirely blown away, and although intimidated by her masterful work, I got in touch and we became fast friends (of the virtual kind). 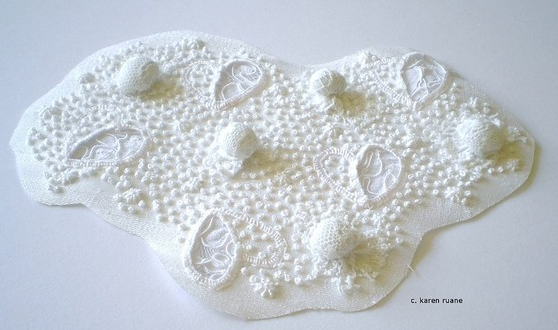 Pictured above is another of Karen’s works, entitled Precious Textile Fragment. This white on white art object, precious indeed, features a broad variety of stitches and techniques carried out with masterful skill. Karen applies her craft in service of both the functional (such as buttons and cards) and museum-quality fine art works that are conceptual and personal. From her wonderful blog she states: For centuries women have used cloth as a tool of comfort and as an expression of beauty within their homes. Creating cloth for warmth, cloth for shelter, our female predecessors embellished these linens with hand stitch using laborious and time consuming techniques thereby enhancing the functional beauty of objects which enveloped and protected their families. Inspired by these women I hope my creations pay tribute to and recognise the devotion expressed in cloth by our female ancestors. Published in Handmade UK magazine, Karen will also soon be offering an online course (hit the link and scroll 2/3 down) with 19 other artisans as part of Alma Stoller’s 2012 STITCHED WORKSHOPS. She also offers hew own online class Embroider, Embellish, Create, here. BTW, Karen’s works of art are copyrighted (this post and all others in this series appear with the artist’s permission). In the New Year, I shall be posting a lengthy rant on the subject of “copying” in crafts, a topic of great debate that I have been burning brain cells on of late. And aren’t you looking forward to that? thanks so much for this Jodi…..